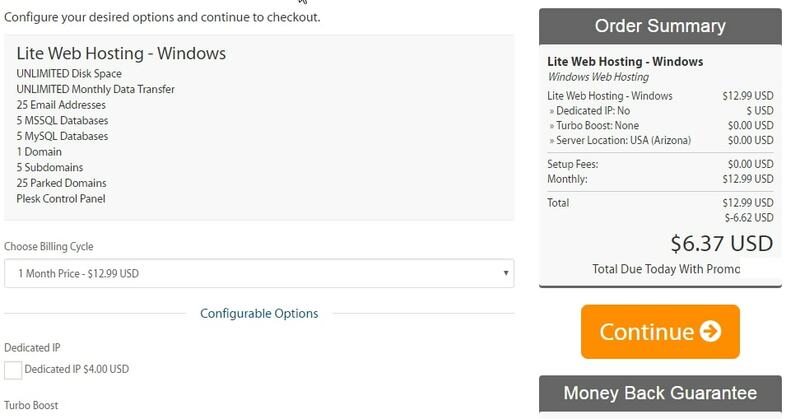 This tutorial is going to walk you through getting set up with a hosting account with A2 website hosting. 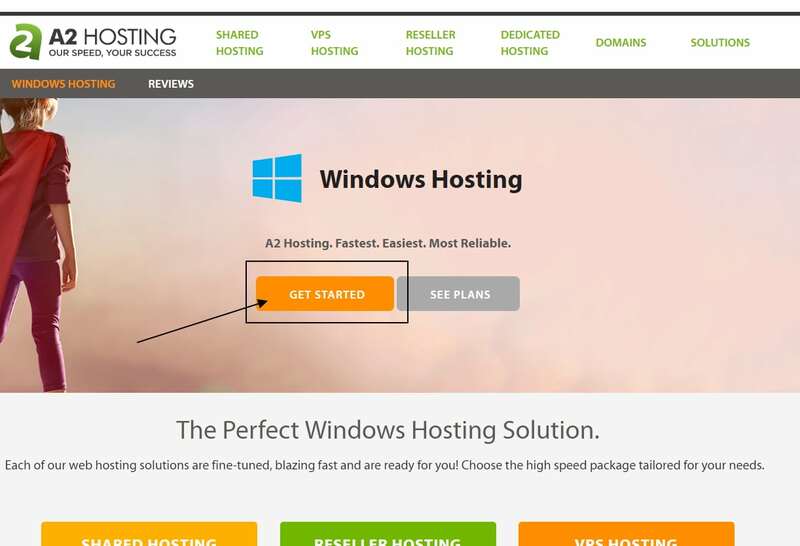 The biggest benefit of using this host is that they allow you to purchase just one month’s hosting. If that is all you can truly afford to get you going on your blog RIGHT now…then this is how you get your blog hosting setup for under $10! Sometimes it will give you options because they are running a sale or promotion. You need “Shared Hosting”. You can probably get your domain cheaper elsewhere. I like to use GoDaddy but there are other domain providers as well. The convenience of setting up your domain and hosting at the same time is one account to deal with instead of two. They are automatically connected which is a plus as well. Don’t worry, it is easy to connect a domain if you register it somewhere else for cheaper so don’t feel obligated to purchase in this step if you don’t want to. This is really just for your convenience. If you haven’t fully committed to a specific domain name, aren’t sure what you want to go with, or just having trouble coming up with a good domain name right now, don’t worry about it and skip to Option 4: Use A Subdomain from A2 Hosting. You can always add a domain name later. It is OK.
Did you already register your domain with GoDaddy or NameCheap or whoever? That’s OK you can set it up to transfer in here. Start with Option 2: Transfer your domain from another registrar and follow the steps. I’m not going to go through the steps here but if you do wind up needing help, shoot me an email. If you have trouble with deciding what to do with this step at all, just choose Option 3: I will use my existing domain and update my name servers. Your domain registrar and A2 will provide you with the support to get the two hooked together later. Choosing option 1 and option 4 because will get you started very quickly. If you don’t have a domain this is my recommendation for now. 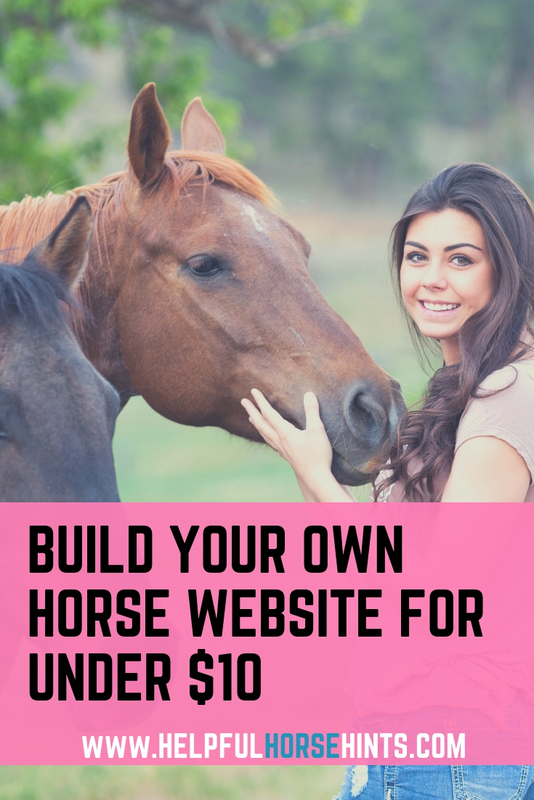 In this step, I used an example but, use this article for tips on choosing a domain for your horse business. 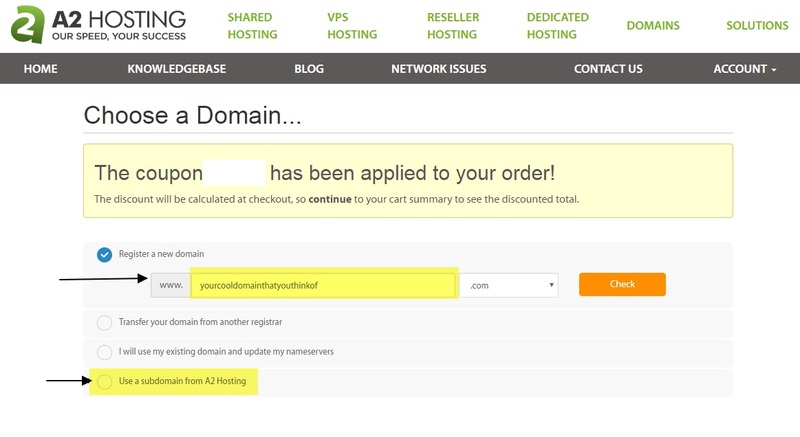 Once you have a domain name you like that is available, you will want to click the green continue button. 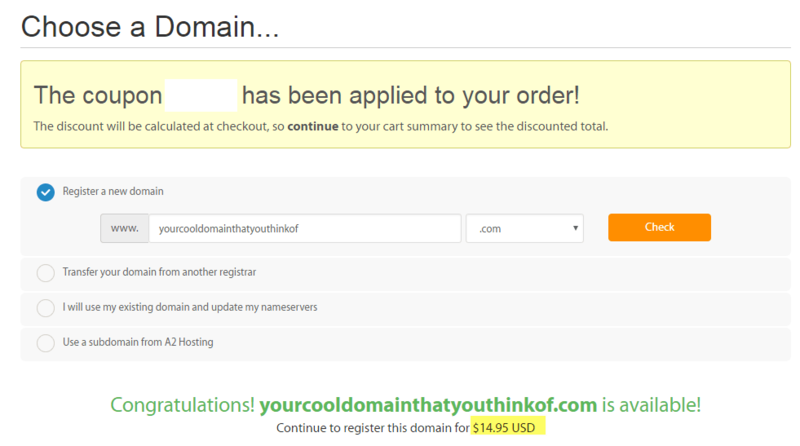 I highlighted the domain registration cost. This can vary. Keep an eye out for it though so you know what it is. I am trying to be thorough so you don’t have any surprises! This dropped my total due today down to $6.37 with the discount my affiliate link was offering on this day. The recurring charge to my credit card will be $12.99 each month for the hosting. Take some time to look at their add-on items to see if any apply to you. You will want to add on or decline some of the domain options they will present to you. This option only applies if you registered the domain here using step 3. Most horse based businesses don’t need domain privacy. If your home is also your farm/ranch and your name, address, and phone number are already public information. Anybody who registers a domain has to provide contact details for that domain. It can either be your real name and home address, real name and PO Box, OR you can choose domain privacy. If you have a PO Box and are OK with people knowing your name…you don’t need Domain Privacy. If you don’t want people knowing your name or if you don’t have a PO Box and are worried about privacy, select the ID Protection. It is an annual fee that you will be charged every year to maintain. If you are running a horse type e-commerce business selling products or tack, etc and don’t want your home address accessible, domain privacy would be the way to go. By choosing domain privacy, generic information will be loaded for people looking to find out who owns the domain. You still can put whatever you want in your blog, including your full address if you want to, but the domain name lookup services will see the generic information. In this case since DNS Management and Email Forwarding are free you could add those too. I left ID protection and clicked the green continue button. This is the final step. You’ll want to review your cart and make sure it looks correct. In this case my affiliate link results in a 51% discount off the hosting. 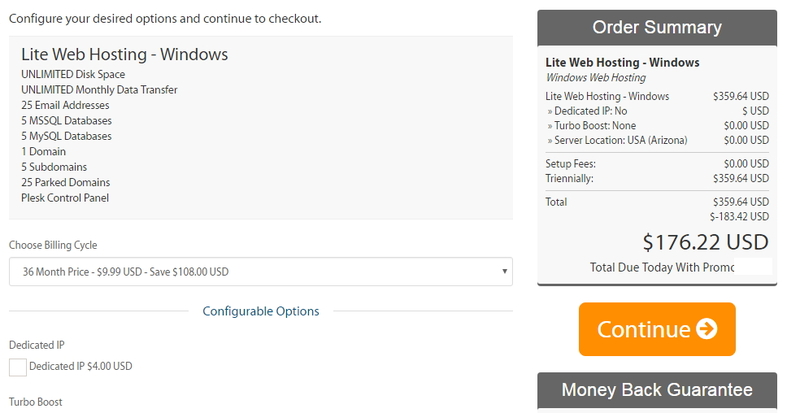 We can see that the $14.95 domain registration and the $9.95 privacy show up on one line as a total of $24.90. The total due in this example is just $31.27! If your address is already public and you’re ok with that…your total is just $6.37! 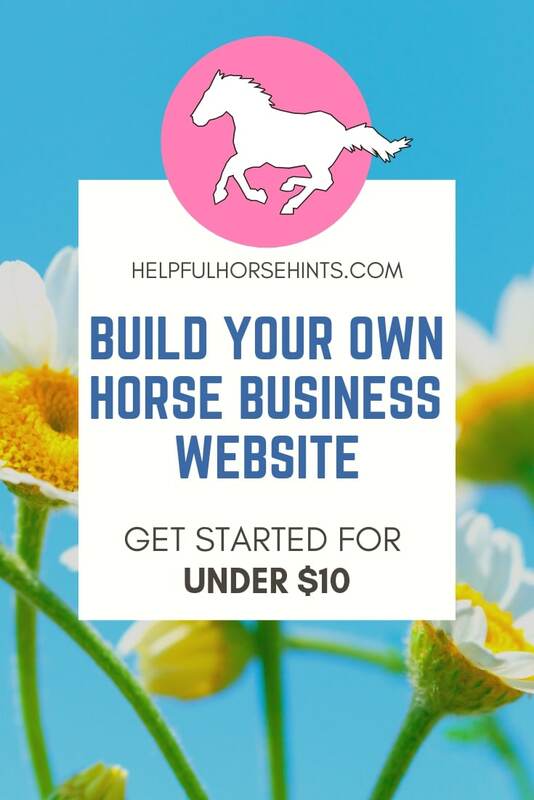 Once you check out you are ready to get started building an awesome website for your horse business!